In Greece we love fish recipes and most of them I keep rather simple. Fresh fish is wonderful seasoned with only salt, pepper and oregano and then grilled or broiled. It is then served with “ladolemono” sauce. Fish is very healthy, so I try to make it for dinner at least once a week. Some times I jazz up a little with different pestos, depending on what I have at hand or just make a simple dressing, each time giving a completely different flavor. There are several ways you can prepare fish with pesto. You can broil it, roast it, bake it, grill it, or pan-sear it! One of my favourite methods is “Sti Ladokolla”. 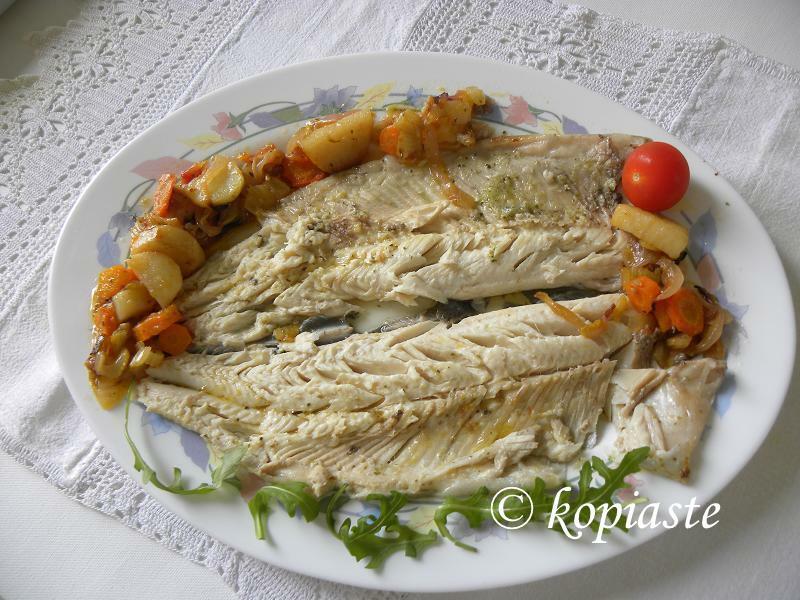 Sti Ladokolla in Greek means “en papillote” and is probably the easiest and healthiest way of cooking fish. This is the most usual way I prefer to cook fish. Serve it with your favourite vegetables or a salad and you have a delicious and perfect food for diet. Put all the dressing ingredients in a blender or food processor and mix. Line a baking tin with a long piece of parchment paper, so that it may enclose the fish. Place each trout on the parchment paper and stuff each fish with a tablespoon of this dressing. Pour the remaining on top of the fish. Cover the fish with the remaining parchment paper and cover with aluminum foil. Serve trouts with extra ladolemono on top, if you like and baked vegetables. Easy and great tasting, oven baked vegetables provide an enjoyable side dish not only for fish but also for meats or poultry but on itself it is a delicious vegan meal, which can be enriched with courgettes, eggplants etc., depending on the season. Although the recipe is given second, you should bake the vegetables first and then cook the fish. Put all the vegetables in a baking tin and add the olive oil, lemon juice and water. Sprinkle with salt, pepper and oregano and mix well. Bake for 1 hour 30 minutes or until vegetables are tender, turning twice during baking. Guilthead Bream was seasoned with salt, pepper, oregano, olive oil. It was filleted and placed on a layer of onions and garlic. A few slices of lemon covered the fish and it was placed on parchment paper, which also covered it (no wrapping) and it was baked in the oven. I served it with a potato salad and broccoli. I made this recipe in two ways because some members of the family don’t like tomatoes. Wash and drain the fish. Add the marinade ingredients and let it marinate for an hour. Meantime in a food processor add the rusks and peanuts and powder. Remove in a plate and in the same food processor add the olive oil, garlic, onions, parsley, dill and lemon juice and zest and a pinch of salt and pepper and pulsify. For the roulade: Spread some dressing on the perch and line the cherry tomatoes. Roll into a roulade, secure with toothpicks and crust them with the peanut mixture. Wrap it in parchment paper. Bake in a preheated at 180o C / 350o F for about 30 minutes. For the crusted perch: Marinate the fish, spread some dressing all over it and then crust it with the peanut mixture. Brush a sauteing pan with olive oil and when hot saute the perch on both sides. Finish cooking in a preheated oven for 10 minutes. Greek fish is so delicious that actually the normal way of cooking it is just by adding some salt, pepper and oregano and then grilling it. We then add some ladolemono on top. That’s so easy it’s not even a recipe. Occasionally, I make something different for a change. This time, in each fish I added 1 tablespoon of pesto in the cavity (any kind you have) and baked it in the oven. Before baking, If you like eating the skin, you can crust it with breadcrumbs and pecans. Fish does not need too much time to be cooked. Preheat grill + air and with rack on highest position. Line the baking tin with parchment paper, place the fish and bake for ten minutes on each side. Wash and drain the fish fillets. Put them in a bowl with all the marinade ingredients and rub them with your hands so that they are evenly coated. Set aside for half an hour. Heat the olive oil in a sautéing pan and sauté the fish fillets until browned on one side and turn them on the other side for a few minutes..
Preheat oven at 180o C / 350oF and bake for ten minutes. Serve with savory rice pudding or seasonal steamed vegetables. Healthy and delicious recipes! Thank you for reminding me of healthy eating. Love all of these dishes Ivy, but my faves are the nut crusted fish and the oven baked veges . I love all of these recipe,healthy and delicious,thanks ever so much for the details and pictures that will help as to do well with cooking. Fishing recipes taste the best when they are simple. Have you done an outdoor grilling version yet? I cherish these recipes,healthy and delicious,thanks quite a lot for your posts and pictures that will help as to do well with cooking.